In this video, I discuss what salt is, how it is related to blood pressure, why we’re supposed to eat less of it and how that translates to the food we eat and real-life things we can do to cut down on the salt in our diets while still eating delicious food! The text of the video is below. Some items, such as “tips to reduce salt when eating out” and the equation for figure out how much sodium is in your salt at home, as well as figures and pictures are not included on the video. What do you think of when you think of salt? In chemistry, salts are ionic compounds that result from the neutralization reaction of an acid and a base. Salts are responsible for countless essential things that you may not think about including growing food, sanitizing pools and drinking water, making computers work, creating nanotechnology, keeping things cold, melting ice, laboratory tests to diagnose diseases and drugs to treat them. Salts can give food any of the 5 flavors – salty, sour, bitter, sweet and savory. They can be every color of the rainbow. But that’s probably not why you decided to watch this video. Like most people around the world, you’re most concerned with the health effects of sodium (aka. NaCl or sodium chloride) in your diet. 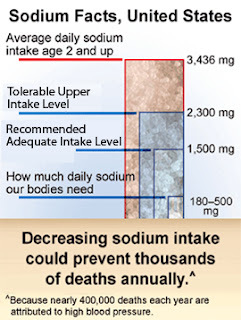 The average American gets almost 3,500mg sodium per day – way more than 2x the recommended amount and 1,100mg more than the tolerable upper intake. Definition: tolerable upper intake is a term used to caution against excessive intake of nutrients that can be harmful in large amounts. This is the highest level of daily consumption that current data have shown to cause no side effects in humans when used indefinitely without medical supervision. Don’t get me wrong – we need sodium to survive. How much do you think we need each day for survival? 180-500mg. Assuming we need 500mg, the average American gets 7x that. Because nearly 400,000 deaths each year are attributed to high blood pressure. As people eat more salt (on average) blood pressure increases. The opposite is also true – when populations of people eat less salt, blood pressure decreases on average. While it is true that many people will get high blood pressure as they age, it has been shown many times that populations of people that eat low salt diets do not develop high blood pressure at the early ages that people in the US (and countries with similar diets) do. For these groups of people, it is recommended you consume no more than 1,500 mg of sodium per day. For anyone else, the recommendation is no more than 2,300mg of sodium per day. But want does this really mean for real people? How much salt can you have each day? That’s why I’m here. First, a few more numbers. You’re supposed to have no more than 1,500mg per day if you’re in one of the groups listed above or 2,300mg if you’re anyone else. How much salt is this? Are all salts created equal? No. Diamond Crystal Kosher Salt weighs 142 g per cup. Wow – that’s a big difference! 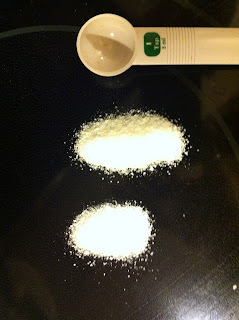 You can eat twice as much Diamond Kosher Salt by volume as you can regular table salt. No, I have no affiliation whatsoever with any salt company! Why is this? I use Diamond Crystal Kosher salt when I cook because, well, I’m used to it and know how much saltiness a pinch adds to a dish, but also like it because there’s less tendency to over salt, it is pretty inexpensive, has no off flavors and has a nice crunch. How much sodium is in your salt at home? If you want to find out how much sodium is in the salt that you use, you’ll need a scale that weighs in grams. Weigh 1 level cup of your salt (making sure not to include the weight of the container) and then multiply that number by 40% (or 0.4) to give you the grams of sodium per cup since salt is 40% sodium. Now multiply that number by 1000 to get the number of mg of sodium per cup. Take this number and divide by 48, which is the number of teaspoons per cup to get the mg of sodium per teaspoon of your salt. Unfortunately, it’s not as easy as saying “hey, I’ll measure out my allotted amount of daily salt and use only that.” At least 75% of the salt an average American eats comes from processed food. Unless you make all of your processed food at home by opening cans and boxes and measuring portions and recording sodium per serving, it is almost impossible to keep track of your daily sodium – unless you minimize high salt processed foods and eating out. The absolute best thing you can do to reduce your salt intake is to prepare more meals at home using fresh, unprocessed or minimally processed foods. I give a number of other tips in other blog posts, particularly the recent on Flavoring Foods with the Farmer’s Market Bounty…Not a lot of Salt and will continue to address this issue in future posts because it is so important, but again, the best thing you can do to reduce your salt intake is to cook at home. This doesn’t mean you have to slave over the stove three times per day to make wholesome, elaborate meals. The point of my blog is to show people how to make healthy cooking, delicious, time effective and reasonably priced. If I could eat healthy as a poor kid in college and now as a time-strapped internal medicine resident, then you can, too! 2) Taste before you add salt. 3) Try adding something with a bit of acid – like hot sauce, lemon juice or a few drops of vinegar – either before adding salt or along with adding salt since the combination of acid and salt helps to bring out flavor in foods. 4) Use fresh and dried herbs and spices to add flavor. 5) Add interest to your plate by eating a variety of colors, flavors and textures – we eat with all of our senses and the less dull your plate is, the less likely you are to feel the need to add salt. 6) If you do use processed foods, opt for low sodium or salt-free versions. You can always add salt or other seasonings or flavorings to taste later and will definitely add less than the processor would have in the full-salt versions. 1) Opt for sauces and dressings on the side so that you can add only the amount needed as these items are generally salt heavy. 2) Stay away from soup unless it is made completely from scratch. 3) Stay away from tomato-based sauces unless they’re made completely from scratch with fresh tomatoes since the canned tomatoes used in most restaurant preparations of pasta and pizza sauces are very high in salt. 4) Avoid cheese and deli meats. 5) Look for foods that are grilled, baked, steamed, sautéed or roasted. 6) Ask if your dish can be prepared with little or no salt. 7) Avoid chain fast-food or fast-casual (i.e. Applebee’s, Chili’s) because food is usually just assembled and there is little control over preparing something with less salt. However, you can look at these restaurant’s websites for sodium information and pick a dish ahead of time that’s lower sodium. 8) Any item with a lot of fruit and/or vegetables in it that is not a casserole or cream and cheese-based dish is likely to be a low-salt option. 9) Stay away from salty condiments like soy sauce, pickles, olives, ketchup. 10) The sauces on Chinese, Japanese, Thai and Indian food generally tend to be very high in salt, again try to get sauces on the side and add only as much as you need to steamed or lightly stir-fried vegetables and rice. 11) Choose sorbets and fresh fruit for dessert or a small piece of dark chocolate or share a dessert with the table. Finally, it is really important to get plenty of potassium in your diet to maintain a healthy blood pressure as well. The recommendation is 4,700 mg/day of potassium. All the details of potassium will have to be another video, but eating a good variety of fruits and vegetables is the best way to get enough potassium. Thanks for joining me, A Chef in Residency – I hope you’ve learned something to improve your health and I wish you all Happy Cooking! Thanks Doctor Hauser. Happy you discussed salt. And great tips. I have eliminated canned goods as they have sneaky amounts of salt (esp canned soups).